If there is no need to write data to the USB stick / USB flash drive during normal use, it can be a good idea to distribute USB sticks that are write protected. Many USB sticks have a physical hardware switch that can be used to turn on write protection. If you distribute your USB stick with write protection turned on, it will not be possible to add contents or change contents on the USB flash drive via software. The write protection will also prevent user's from formatting the USB flash drive, or delete files, by mistake. With write protection turned on, the USB flash drive will function like a CD or DVD; all contents on the drive will be read-only. But if the user, for some reason, wants to store data on the USB stick, he/she can turn off the write protection temporarily by changing the switch's position. 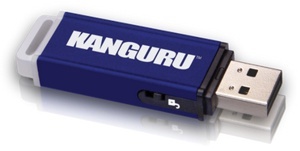 Thereafter he/she can save or update data on the USB flash drive. The pictures to the right shows two USB sticks with a physical write protection switch on the side. The switch lets the user to easily swap between read-only and read/write modes.